We don’t ask for a lot. Don’t take things that don’t belong to you, drive with both hands on the wheel, and keep your hands to yourself. Some people don’t like to listen. 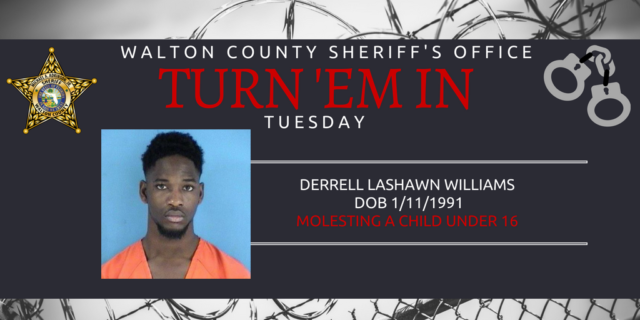 Derrell Lashawn Williams, 27, is wanted for molestation of a child under 16-years-old. Williams currently has an active warrant for lewd and lascivious behavior. Walton County Sheriff’s Office has attempted to locate him at his home in Defuniak Springs and at his place of work where he asked family members to collect his paycheck for him. So, we believe he knows we’d like to have a chat with him. Anyone with information is asked to call the Walton County Sheriff’s Office at (850)-892-8186 or you can remain anonymous by calling Emerald Coast Crime Stoppers at (850) 863-TIPS. Submit a web tip at http://www.emeraldcoastcrimestoppers.com/ or send a mobile tip using the P3 Tips Mobile Application.